The celebrations of Pope John Paul II in the lead up to his canonization this weekend brings back memories of being in Rome for his funeral—a truly amazing experience. As president of the International Movement of Catholic Students (2003-2007), I was sent to Rome from Paris when we heard about the death of the pope. I thought that it would only be in the city as a symbolic representative of the organization’s members around the world. Little did I know that I would end up participating in the official ceremonies in a (odd) tradition that can only exist in Catholicism. The following is a reflection I wrote following the event nearly a decade ago. If people’s reaction to someone’s death is a sign of how a person lived a life, then Pope John Paul must have been an impressive person. While he certainly (like all people) is not beyond criticism, particularly in the ways he handled liberation theology and his positions on women, he will be remembered for his role as a leader, pastor, peace builder and a supporter of young people. 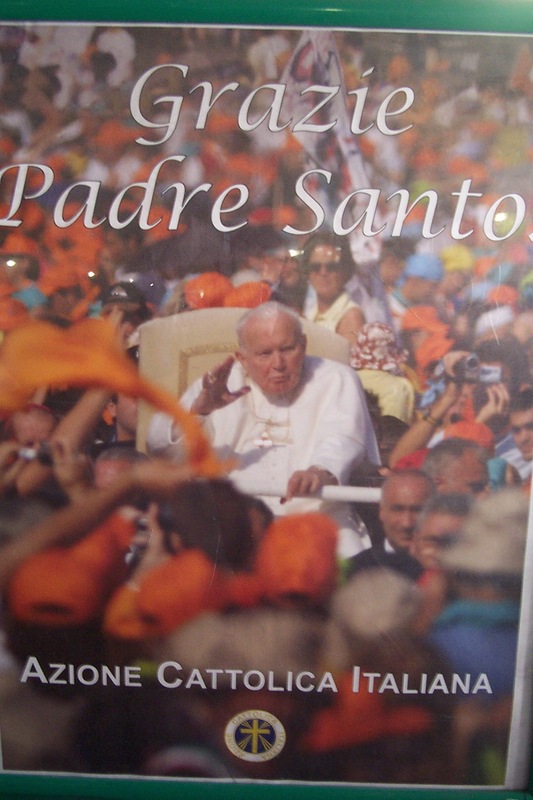 These aspects of his life were reflected in the reaction of the three million people who flocked to Rome to pay their respects to one of the most charismatic figures of our times. 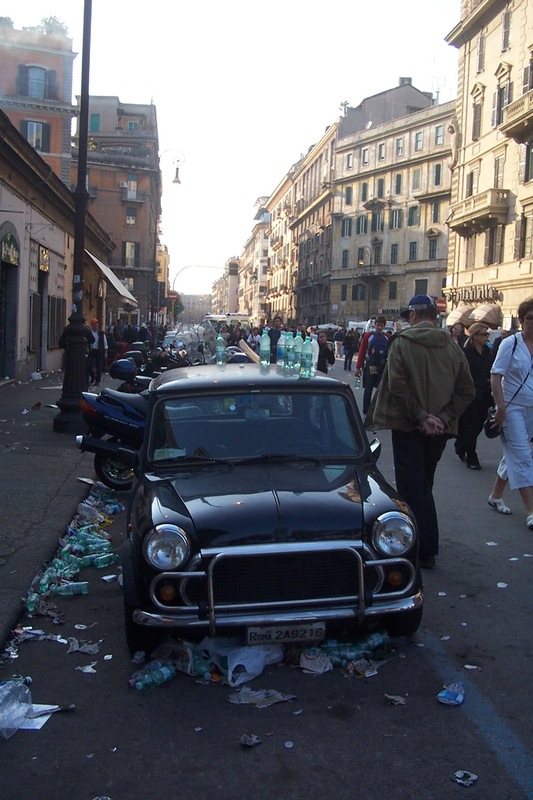 As soon as I arrived in Rome, the city was distinctly different than it had been during my last visit only two weeks earlier. The streets were alive with a buzz of energy (and confusion) as the faithful and the curious alike began to converge. Thousands of Italian volunteers, police, boy scouts, and military personnel deployed around the city. Roads were closed, security levels were heightened, and the daily life of the Romans was interpreted. In many ways, the city felt very much as it did during the World Youth Day in 2000. One of the most incredible things to see was the line of people waiting to enter St. Peter’s to pay their respects to the pope. The line winded through the ancient streets of Rome, in and out of the old fortification wall from the Vatican to the Castle of St. Angelo. At one point, it was said to be 8 kilometers long with people waiting over 20 hours to file quickly past the body of the Holy Father who lay in state in the center of St. Peter’s Basilica. Vatican officials estimate that two million people had the opportunity to view the body. It was interesting to see the reactions of the people as they were quickly shepherded past his body. Everyone had a different reaction. Some cried, others made a sign of prayer or reverence and many (even some bishops) took pictures. The experience was overwhelming. Most people did not know exactly what to do after waiting in line for a fleeting moment. In the first few days, the majority of the pilgrims were Italian – an appropriate tribute to the bishop of Rome. As Friday neared, more and more Poles began to fill the streets with the red and white flag of Karol Wojtyla’s homeland. Many drove in caravans for almost two days to pay respect to the man credited by many for the bringing democracy to their country. Others came from France, Spain, Africa, Asia and the Americas. With no available hotel rooms, pilgrims slept wherever they could. On Thursday night, the streets near the Vatican were filled with tents and sleeping bags and every street was littered with scraps of garbage and empty water bottles. As I walked around the city, I was struck how many areas near the Vatican reminded me of Lower Manhattan after September 11th. Makeshift memorials with vigil candles, flowers, personal items, pictures and children’s art were common. The death of the pope introduced elements of the rich tradition of the church that many of us had never known in our lifetime. In the past few weeks, our vocabulary has included words like “camerlengo” and “conclave.” We have learned about how the College of Cardinals will elect the next pope and through their biographies we have become aware of different structures that help lead the church at the global level. One little known tradition surrounding the funeral has existed since 1881, when the body of Pope Pius IX was transferred from the Vatican to an outside cemetery. During the procession, young men from Italian Catholic Action stopped an attempt by the Freemasons of Rome to throw the casket into the river. Since then, young men of Italian Catholic Action have been asked to stand “Picchetto” next to the body of the Pope. 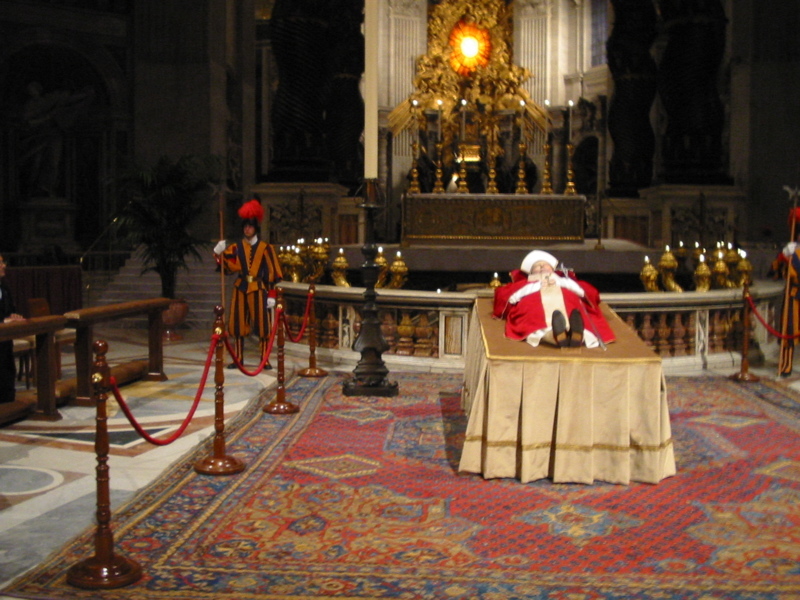 This tradition continued with Pope John Paul II, with two men standing just a few feet behind his body during the time of the viewing. On Thursday morning, I was invited by the Italian Catholic Action and our student group in Italy (the FUCI) to participate in this tradition. It was one of the most powerful experiences of my life. For two shifts of about 20 minutes I stood about 15 feet from the body (right next to the Swiss Guard standing in the back on the Pope’s left hand side). I also had the opportunity to spend the rest of the morning in prayer and reflection in St. Peter’s, only a few meters behind the main altar and body of the pope. This gave me a unique vantage point of this incredible event. 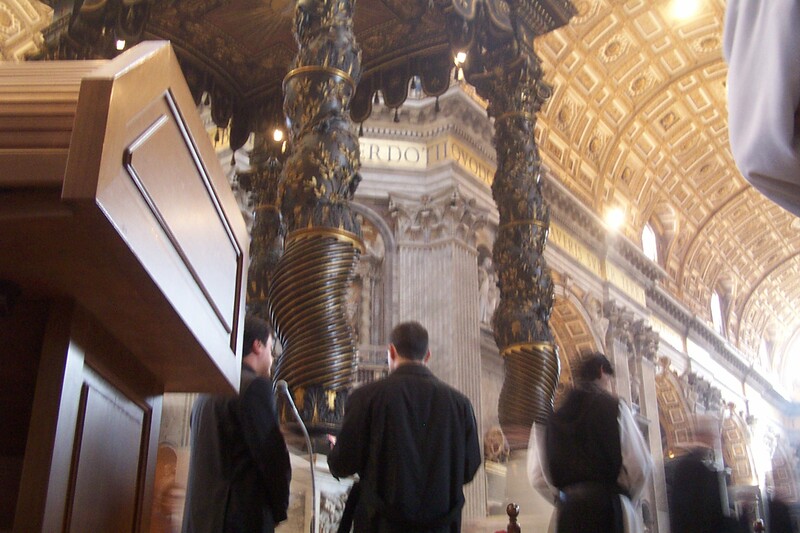 Between the chapel of the chair of St Peter and the main altar were streams of “VIP pilgrims” who got to go close to the body for prayer. These included cardinals, bishops, heads of state (even the governor of NY), newlywed couples in their wedding dresses, the disabled, priests of all ages and nationalities, and groups of nuns and monks. All these groups moving about reminded me schools of fish moving around. Despite my own personal reservations about some of the pope’s policies, I was deeply moved by the expressions of unity amid diversity, prayer amid chaos, and genuine human emotion in what might otherwise feel like a staged or orchestrated event. While there are many lessons we might take from the life of John Paul II, what lessons might we find in his death? The climax of the week was the funeral Mass for the Holy Father on Friday. As with the days before, the weather on Friday was clear and sunny. Many of the pilgrims who had flocked to Rome filled St. Peter’s Square and the surrounding streets while thousands of others were scattered around the city to watch the Mass from 30 outdoor televisions. Upon entering St. Peter’s Square, it was overwhelming to see the huge crowds. Hundreds of bright colored flags waving in the wind and the stage filled with Church leaders and dignitaries. 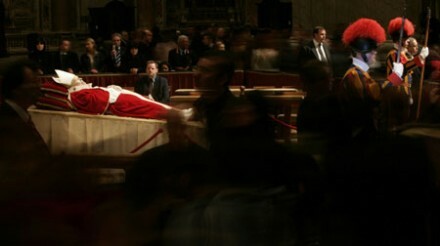 With helicopters circling overhead, the body of the Pope emerged from the Basilica in a simple cedar casket. As his body entered the square, the crowd erupted in respectful applause for their leader. Several moments later, as the College of Cardinals emerged, with their red vestments blowing in the wind, the crowd again applauded the body who would soon decide John Paul II’s successor. One of the many things that characterize the pontificate of John Paul II was his commitment to peace and justice in the world. As part of this commitment he worked for global solidarity, begged forgiveness for many of the sins of the Church and publicly opposed the two American led wars in Iraq. As part of the celebrations, heads of state from more than 70 countries and delegations from most of the others came together in a fitting tribute for this man of peace. Incredibly, those present included the heads of state of the United States, United Kingdom, France, Germany, Iran, Israel, and Syria. President Bush who attended the Mass with the leaders of countries he has previously termed as “evil” sadly did not take opportunity to try to outreach to them. In a powerful testament to the Pope, the president of Israel, Moshe Katsav in the liturgical sign of peace greeted both the presidents of Syria and Iran, a powerful moment considering that Israel and Syria are still technically at war. Much like his life, the commemorations of John Paul II’s death highlights at least three pastoral priorities for the church going forward: the universality of the church; the challenge of working for peace; and the need to empower and support young people. For those of us who celebrate the life of the Polish pope, are we ready to take on these priorities?